The George W. Marston Correspondence Collection is the latest finding aid published by the Archives. This collection includes correspondence between Marston and Pomona College presidents James Blaisdell, Charles Edmunds, and E. Wilson Lyon. 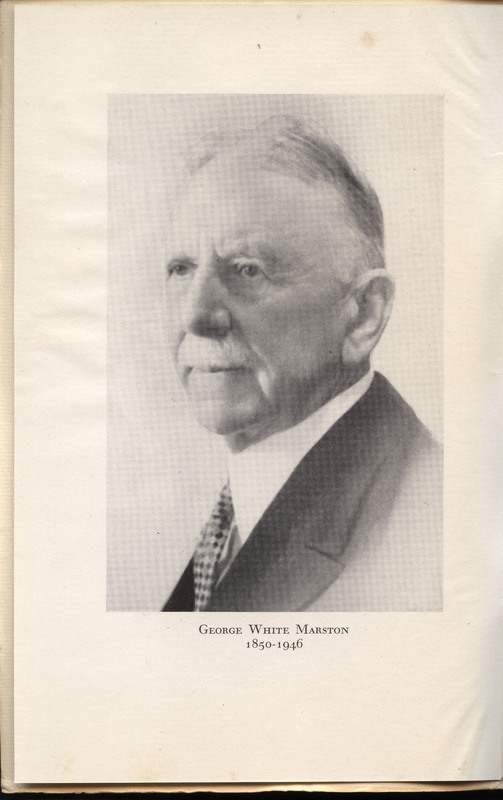 George White Marston (1850-1946) served as founding trustee for Pomona College and had a critically important role in the founding of the College. He donated his time, money, and good cheer to Pomona from 1887 until his death in 1946. His influence can be seen across campus in a number of campus building projects which he funded: the beautiful Marston Quad, Smiley Hall, Florence Carrier Blaisdell Hall and Lucien Frary Dining Hall. Although Blaisdell Hall and Frary Dining Hall were the result of his generosity, he insisted that they be named after Mr. Blaisdell's wife and an early trustee (Herring, Hubert; The Education of George W. Marston, p.23). His contributions to Southern California are many: the establishment of Balboa Park, Presidio Hill, and he persuaded the state of California to create Borrego State Park. This collection includes correspondence between Marston and Pomona College presidents James Blaisdell, Charles Edmunds, and E. Wilson Lyon. For more details, you can see the finding aid here: George Marston Correspondence Collection [pdf] .